I have been blogging since 2012 and only recently have a seen how to turn a blog into a business and earn a real income from it. Blogging is a great way for women like myself, a stay at home mom, to keep connected and feel like we are contributing to our communities and our family’s finances. I have been treating my blog as a business instead of just a hobby for about 3 months now and I have seen a major impact money wise. It takes a lot of time and effort but I actually enjoy what I am doing instead of sitting at a job that I despise. Here are a few things I think hobby bloggers needs in order to turn a blog into a business. I have decided that I will do a few posts on blogging. I know that a lot of Moms, Dads, and even college students are looking for ways to earn extra income and blogging is one way to do that. 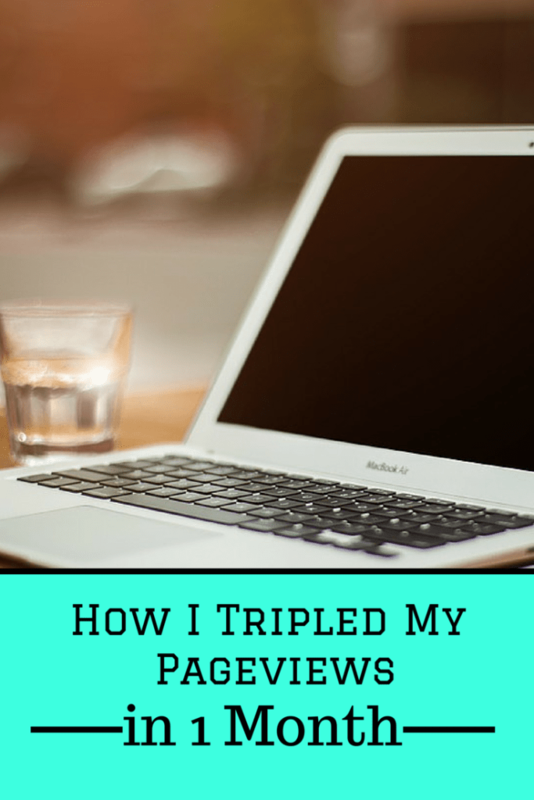 This post is about how I tripled my pageviews in just 1 month! I have been blogging for about 3 years now but I have just started treating my blog as a business. I stay at home with my daughter and this is one of the ways I am able to stay home and still make an income. I plan on doing posts like this periodically so that you can see if blogging is something that might work for you. If I can do it, anyone can! So, I know I have been away from the blog for a while and I am trying to fix that. For the year of 2015, my goal is to start blogging a lot more then I have been. I had no idea how much of my time was going to be devoted to taking care of my sweet baby girl. I thought I would be able to work on the blog when she napped or went to bed but between Colic, a DOC band, separation anxiety, and now teething, that just didn’t happen. So some of you may have noticed a big change to the look of the website. I was so lucky enough to win a brand new blog makeover from April over at A Mommy’s Blog Design! I love the whole look especially the colors. I also like how cleaner it is too. This is actually one of her premade blog designs that I got to choose from. Hopefully one day I can get a custom design but this is a start. What do you think? Do you like this look better then the last one? The new look is just the beginning to some of the changes that I’m going to be making; nothing too drastic though. I have started adding a new category called “Recipes”. This is where I’m going to show off all the new recipes I’m going to be trying through the year. Don’t worry they will be easy and budget friendly :).